The 2018 Honda Civic Type R is easy to dismiss on paper. Its 2.0-liter turbocharged I-4 makes "only" 306 hp and 295 lb-ft of torque, about average for the segment. And what criminal would send that power to only the front wheels? That would've been considered heresy back when I was a kid, but Honda has good reason: Front-drive with a limited-slip differential keeps both weight and the center of gravity low, with the ultimate aim of making it more fun to drive. It also makes the Type R cheaper. Its $34,990 as-tested price is the lowest of our four. Despite the lack of all-wheel drive, the Civic Type R certainly looks like it belongs. The Gundam styling features a wide variety of functional aero add-ons, such as a massive rear wing and hood scoop-which, fun fact, cools the computers that run the Type R's electronic adaptive suspension, not the engine-and embellishments such as red accents and three center-mounted exhaust outlets. 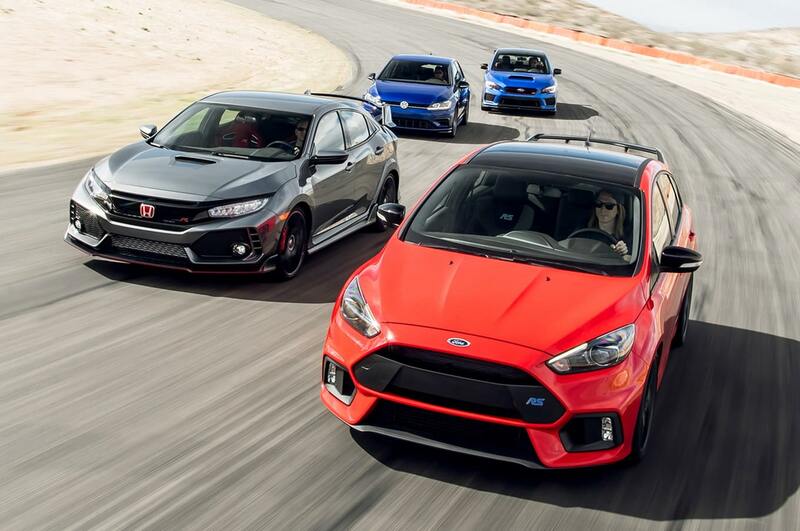 Its styling is certainly more polarizing than our other three pocket rockets; I love it, but Evans said the Type R "screams 20-something asshat." Hi there! Despite Evans' (or my) lack of taste, there's no denying that this car can scoot. It makes everything feel absolutely effortless-natural even. The Civic's Ohio-built engine is a little monster; it makes linear power off the line before finding a second wind as it blasts from 3,000 rpm to its redline. The clutch and six-speed manual action are also best in our test. "This might be the goldilocks of the group; it just does everything well," Walton said. "I learned where the power lived-it comes on strong just over 3,000 rpm and gets better from there-and used it to my advantage."